"The Red Thunder" clouded my mind with images of superhero movies from the 1990s. I can't quite explain why this was the case, it just was. I always find it amusing that certain individual elements have the ability to take us back, maybe to a time when unusual people or heroes were all the rage. Now days, superheroes have made a comeback. So why not make an indie film right? Much like our memories of something from the past don't always live up to what we think, this short film simply was not what I had thought it would be. If "The Red Thunder" was akin to an action film from 1990 in my small mind, in real life, it was a little shorter with a receding hairline. It wasn't like watching an old VHS tape, anything and everything except those blurry visuals that used to fill my screen. Director Alvaro Ron knows how to coax some great shots from his crew, and does manage to keep things entertaining. This film just felt like it had been done before, many times. It also made me chuckle a time or three. Something that "is" rare for an indie superhero film. For that I was very grateful and more than a little surprised. The technical aspects of this short film are where it really shines. Written simply, "The Red Thunder" is a beauty to watch. Contained within are no traces of the usual "indie staples" that we've all come to look for. The cinematography, lighting and look of this film rival anything a medium budget studio produces. The look alone may just be the reason I had no problem watching until the very end. The fact it's edited together with a slick polished style sure doesn't hurt much either. 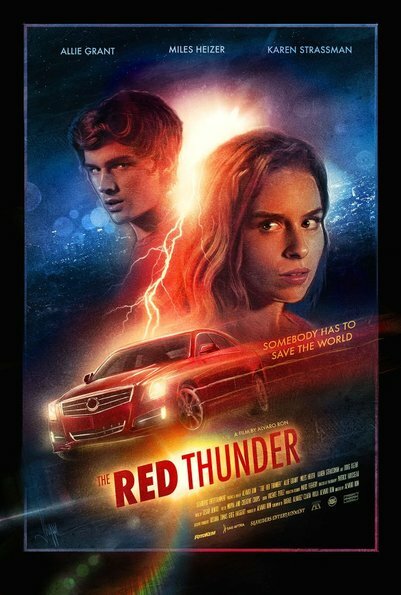 "The Red Thunder" boasts some of the best production and post-production work I've seen recently when watching independent film, easily pushing it hands and feet above most others. With that written, the only question left would be to ask if it's worth actually watching? Even the best "looking" trash at the curb is still garbage. I'm happy to write that although not the most original story ever written, there's enough here to make a simple yet entertaining short film. Combine that with some good acting from the cast and you've got a contender! My only real peeve with this film the unoriginal story and forced humor. I was just expecting something a little more unique considering the lead-up. I just can't help think of what this movie could have been as I watched what it actually was. "The Red Thunder" is a visual power-house crammed into a really short film. So long as you go into it expecting a lighthearted, unoriginal adventure, it won't let you down. The brilliant execution from the production team, as well as the cast, easily push this movie above and beyond what most would consider decent. For me, this was time well spent and although seemingly a little over done, so are most superhero film lately. Maybe there is something to the whole 1990s vibe after all.